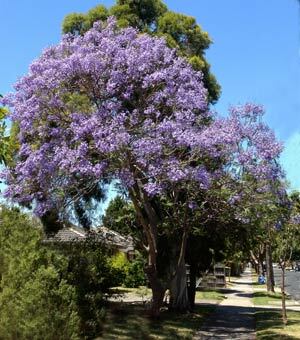 Jacaranda mimosifolia is the most popular Jacaranda tree and is used widely in street plantings especially in New South Wales and Brisbane. Masses of lilac flowers cover the trees in summer creating a strong visual effect. Fast growing and deciduous these trees are originally from South America and prefer a warm climate and a well drained soil. They grow well in many areas of Australia, as far south as Melbourne. Used widely as street trees, they also make an interesting specimen tree in the larger garden. Masses of purple flowers these trees are also fairly low care. Little to no pruning is required except for the removal of any dead or damaged limbs. Jacarandas do like a well drained soil, during especially wet winters flowering can be a problem with trees not blooming as prolifically as normal.Other reasons for poor flowering include pruning, frosts and lack of light. The Port Wine Jacaranda or ‘J. semiserrata’ and J. caerulea are not as popular as J. mimosifolia. The so called ‘yellow jacaranda’ is actually Shizalobium parahybum, again form Brazil it can grow to 35m. Great trees for street planting or a large shade or feature tree. Quality Trees and Shrubs. Large range of ornamental and fruiting plants. Supplying Landscapers and Retail Nurseries. Strictly Wholesale. All states except WA. Suppliers of advanced evergreens to the landscaping industry. Growers of natives, exotics and a selct range of deciduous trees to 4m. Contract growing to client specifications.